Starting around 2003, car ownership rates started to level off for an obvious reason: we had hit a rate of nearly one vehicle for every adult in the country. There just wasn’t much higher to go. Then, when the Great Recession started in 2009, car ownership dipped modestly. We have more recent data here, so we can see that car-free living went up during the Great Recession but then dipped back down when the economy picked up. The recession hit young people worse than the middle-aged, so a sizeable gap had opened up by 2011. That gap narrowed a bit by 2016 as people started buying cars again, but it was still bigger than it was in 2005. Young people weren’t giving up their car-free status quite as quickly as everyone else. The far right column shows the change in car ownership. The number for millennials is slightly higher than the others, but they’re all very close to zero, which suggests no change by age group once you control for income. In other words, millennials have reduced their car ownership slightly, but mainly because they were harder hit by the recession. Overall, I’d say the evidence suggests, at most, a very slight decline in millennial preference for cars. 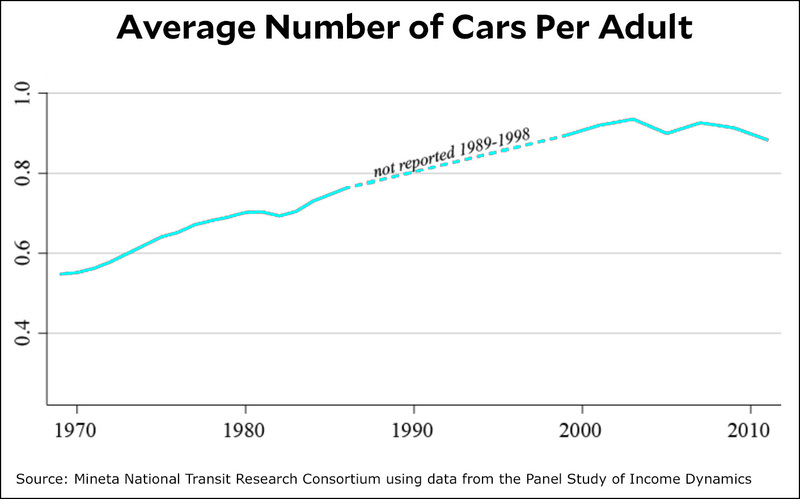 The notion that they’ve given up on cars in favor of bicycles and mass transit just isn’t true. So why is this so commonly asserted? At a guess, it’s because the people who write about it mostly live in large cities, where it’s common to be carless—and became even more common during the recession. That led to lots of feature stories about young people who don’t even have driver’s licenses anymore, and eventually to a vague conviction there was some kind of trend here. Not only was this an overreaction to something that was mostly a symptom of the recession, but it’s also a bit of a “no one I know voted for Nixon” thing. Even if millennials in New York and San Francisco are driving less, that’s only a tiny fraction of the whole country. When you broaden your focus, there’s really nothing much going on.